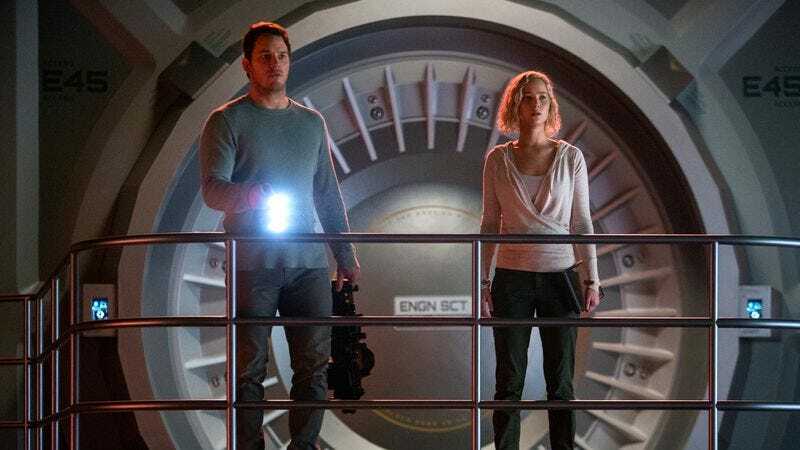 During the voiceover narration at the end of Passengers, Jennifer Lawrence’s Aurora Lane says of her romance with fellow would-be space colonist Jim Preston (Chris Pratt), “We found each other.” Which is a nice sentiment, but they didn’t find each other. He found her, woke her up because he wanted to date her—knowing full well he was dooming her to share his meaningless life of sterile isolation—and then tried to pass off that decision as desperation borne out of loneliness when the robot ratted him out. (The robot will always rat you out.) She had no say in the matter. And while this is unsettling on its own, by the end of the film Passengers has gone full Stockholm syndrome, with a weeping, hysterical Aurora desperately trying to resuscitate Jim after he nobly sacrifices himself for her and the other passengers on the ship. True, he offers to put Aurora back into hibernation once he figures out how, but from all appearances she doesn’t take him up on the offer, and they spend the rest of their lives canoodling in the Avalon’s space pool. What is that, besides falling in love with your captor?